Ever wanted to know more about your past? Introduction to Family History is designed for people interested in their own family histories or genealogy in general. You will learn how to research family history accurately and efficiently using the growing range of online family history resources. You may be surprised at what you discover and what you can share with family and friends. 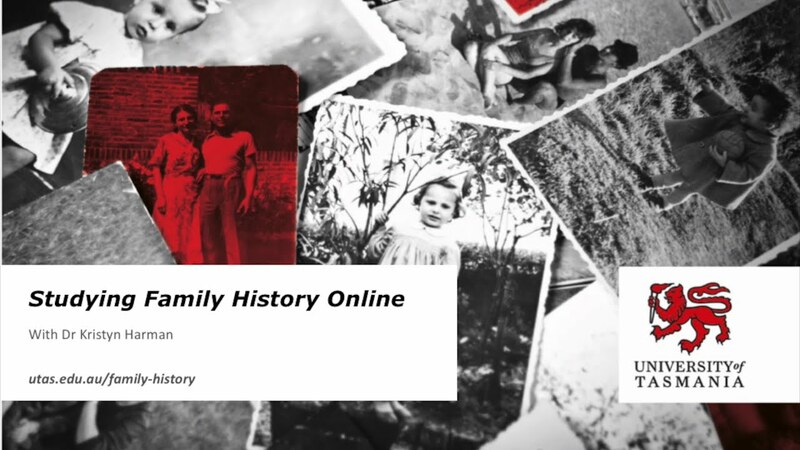 Online: Introduction to Family History is part of a fully online suite of units which enable flexible study. It is one of five foundation-level units available in the Diploma of Family History. Students must complete four foundation-level units and four 100-level units to complete the Diploma. As part of Family History Month 2018 Dr Kristyn Harman, course coordinator of the Diploma, presents her talk with course graduate Caroline Haigh at Libraries Tasmania. "I am an experienced family history researcher, but I felt that I was probably overlooking vital information. This course (Introduction to Family History) was a great learning curve for me, but the two most important things I learnt was to maintain a strict research log and to read all documents thoroughly. This course is highly recommended." Most Australian or New Zealand citizens, or holders of a permanent visa are eligible for a Commonwealth Supported Place (CSP) when studying the Diploma of Family History. In 2019, for CSPs the student contribution is $820.00 for Introduction to Family History. These costs can be deferred under the HECS-HELP loan scheme for eligible students. Completing an eCAF form is a requirement for all students. The eCAF is a government form that is available online through eStudent. Instructions for how to complete the eCAF form will be included in the content for Introduction to Family History. Also see eCAF Instruction Guide (PDF 531KB). Should you have any problems submitting your eCAF, please contact us by email ASC.Contact@utas.edu.au, phone +61 3 6226 6365, or the Contact Us online form. Who can apply for Introduction to Family History? The next offering of Introduction to Family History will run from 1st July - 23rd August 2019. Applications will close at 5pm on Friday 28th June 2019. You should expect to spend approximately 5-6 hours/week undertaking study in this unit. No. The Introduction to Family History unit is fully online. You will need to have access to a computer to complete this unit. If you don't have your own computer, perhaps someone in your family or a friend has one, or you could use a computer at your local library, on campus in student areas, or at the university library. There will be ongoing assessments throughout the semester. Assessments could include such items as online quizzes composed of multiple-choice and short answer questions (some of which may be time-limited), online discussion forums and/or presenting your genealogical work. There are no exams for this unit. The Diploma of Family History is a course consisting of eight family history units. Students will automatically be enrolled under the Diploma when they apply for Introduction to Family History. If you would like more information please visit the Diploma of Family History or please contact us by email ASC.Contact@utas.edu.au, phone +61 3 6226 6365, or the Contact Us online form. How do I apply for admission to Introduction to Family History? What supporting documents do I need to apply for Introduction to Family History? How will I know if my application is successful and if I have received a place in Introduction to Family History? If you need any assistance to complete the application form, please contact us by email ASC.Contact@utas.edu.au, phone +61 3 6226 6365, or the Contact Us online form. The eCAF (electronic Commonwealth Assistance Form) is a government form that is available online through eStudent. Completing the form is a mandatory requirement for all Commonwealth supported students. Instructions for how to complete the eCAF form will be included in the unit content. Also see eCAF Instruction Guide (PDF 531KB). Please allow 10 working days for us to process your application however if you have not received an email or letter with your password/login details after 10 days, please complete the Contact Us form so that we check your application. The Introduction to Family History unit is delivered fully online. For this reason, you can study flexibly to make up for any time that you may have missed. Please note however that there will be assessment tasks due on certain dates, so please contact us by email ASC.Contact@utas.edu.au, phone +61 3 6226 6365, or the Contact Us online form to discuss starting the unit late. Every unit offered by a university has a published census date. Census date is the last day a student can withdraw from a unit without receiving a financial penalty. For the 2019 offering of Introduction to Family History this date is 12th July 2019. For withdrawal enquiries after census date, please contact us by email ASC.Contact@utas.edu.au, phone +61 3 6226 6365, or the Contact Us online form. Can I use my Introduction to Family History unit result as credit towards a degree? There will be ongoing assessments throughout the semester. Assessments could include such items as online quizzes composed of multiple-choice and short answer questions (some of which may be time-limited), online discussion forums and/or presenting your genealogical work. Learning modules will be scheduled for release across the semester (often weekly or fortnightly). Please contact us by email ASC.Contact@utas.edu.au, phone +61 3 6226 6365, or the Contact Us online form and we will be able to assist you with other options. The official release of results will occur on the date specified in the UTAS calendar. These results will be accessible from 9am on the specified date and are accessible via eStudent. The Introduction to Family History unit can be included as part of the formal requirements for the Diploma of Family History.